We are able to check PV panels are in working order, and suggest solutons should an issue be found. Solar PV Panels do not generally fail but do need to be kept clean and the wiring checked for loose terminals as this can cause failure to the system but can be easily fixed. 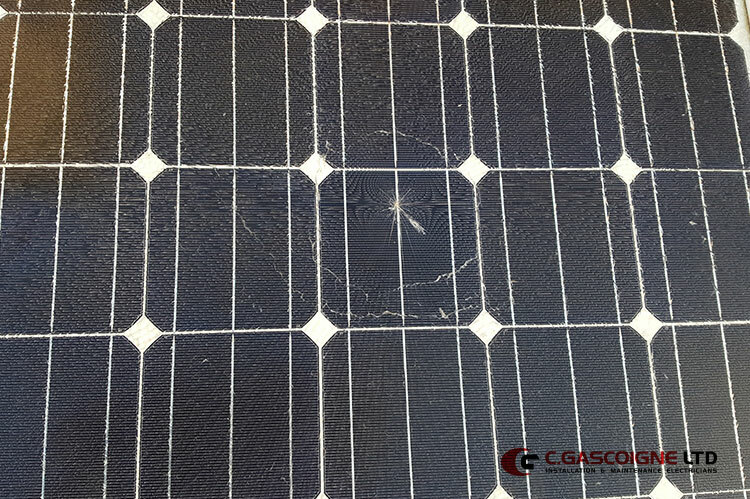 A PV panel can be impacted by dirt, leaves, bird poo and vermin e.g. squirrels who like to eat the connecing cables! Any actual panel failure is normally found at installation stage from the manufacturers production process. Occasionally, the Diodes (by pass) in a panel can fail which can result in a panel becoming in efficient and not generating the expected power as it does not use all of its cells. C Gascoigne Ltd are able to replace diodes if this is found to be the problem, and/or contact your panel manufacturer to see if this issue is covered under the panels warranty. We provide a written quotation for all works for approval prior to work being undertaken. Initially we try and undertake a system analysis “off the desk” without visiting site, this avoids incurring the customer with additional costs, we can then visit site and fix the problem in one visit.